Almost hidden in its urban neighborhood, St. Zoravor is a haven. 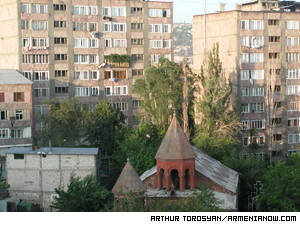 It is a nation of churches, Armenia. One of its newest, St. Grigor the Illuminator, was consecrated by Pope John Paul II during a visit here two years ago. One of the oldest, Geghard, is one of the republic's most popular tourist sites. 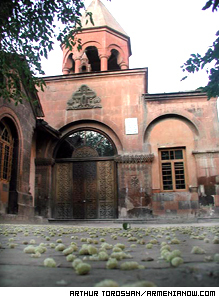 And of course there is Echmiadzin, the very seat of Armenian Christianity. 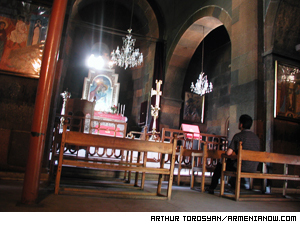 Churches are the centerpieces of Armenian villages. And for some, they are where the soul finds its center. There are churches where you go to talk to God, and churches where you go to listen for God's voice. My favorite is the second sort. Far from the luxurious appointments and ornamentation of St. Grigor, that big white church near the square, my favorite sits unadorned and hidden in the middle of the city. Sourb (Saint) Zoravor fits snuggly among apartment buildings just off Parpetsi Street in Yerevan. Nearby is a bank and a new restaurant and a book store and small kiosks, two political headquarters, this newsroom, tourist agencies, beauty shops . . . so much that St. Zoravor could be easily missed, especially in summer when neighborhood fruit trees hide it behind canopies of green. It is what a church should be - a haven among chaos. It is shaded by mulberry and cherry trees. Yerevan is a terribly noisy city, particularly during these months of so much construction, renovation and street repair. But stepping into St. Zoravor is as if God's own sound barrier has muffled outside interference so that inner voices can be heard in whisper. Inside, worshippers, seekers of faith, the pious and the confused, find a quiet disturbed only by the noise of birds enjoying those fruit trees and the occasional cries of children playing in nearby yards. It is a small chapel with six pews near the altar and two against the back wall. Like other sacred places in Armenia, it holds images of the saints and the smell of burning candles is constant. The very walls themselves emit the aroma of incense that for so many years has been the wings for prayers of the faithful and the faith seekers. I do not know Armenian church ritual. I know that it is proper to keep your hands out of your pockets while in church, and to walk out backward when you leave. I'm always afraid I'll naively do something that offends. I have no religion. And, like the New Testament apostle, I believe just enough to know that I need help for my unbelief. I believe God can be found as surely in a mosque as in a temple or a church or in a parking lot evangelist's gospel tent. Or in a lover's eyes or in a parent's caress. But how God can be found is a mystery to me. More likely, God finds us, I suspect. For in matters of spirituality, I am usually the one who is hiding or is lost. Inside, there is fruit for the soul. And I like that. Too much can be explained in life. Knowing that some things can't be known leaves room for the soul to expand. Lacking anything spectacular as distraction, St. Zoravor modestly invites a person to look inside himself. If you go there, go to listen. You may not hear anything. And in this busy city, that in itself is something of a miracle.